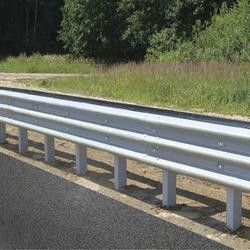 Offering you a complete choice of products which include w beam crash barrier and metal beam crash barrier. W Beam Crash Barrier offered comes in durable and long-lasting construction finish and provide perfect support in protecting pedestrians from vehicles. Other than this, these are also installed in highways to ensure minimized chance of life los in case of accident. We can offer these barriers in surface treatment choices of hot dip galvanized, powder coated and other as required by the customer. Some of its features include secure way to minimize loss of life and property, helps in demarcating roads and preventing straying of pedestrians and animals, ensure safety by preventing vehicles from going out of road. 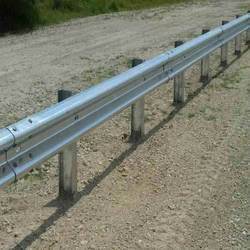 Metal Beam Crash Barrier offered comes in durable and high strength finish and comes designed to provide perfect support as a crash barrier installed on highways as well as on roads with high accident chances. Providing for optimum security, these metal beam crash barriers can be made available by us in 2, 3, 4 and other beam options to pick from. Some of its features include choice of wired and wireless finish, aluminum alloy housing support, can also offer other post options like H post and U post; choice of hot dip galvanized/PVC coated finish, helps in maintaining a neat highway demarcation, prevents and minimizes accidents.